This wrongful death claim was filed in Montgomery County after a man was not properly intubated following surgery. It was filed in Health Claims Arbitration on March 2, 2018, and it is the 103rd medical malpractice case filed in Maryland this year. After a patient's surgery was complete, his doctor placed an endotracheal tube before transporting him to the post-anesthesia care unit (PACU). According to the hospital chart, the man was not in cardiac or respiratory distress prior to changing the endotracheal tubes. Immediately upon arrival at the PACU, the patient went into cardiac arrest and CPR was initiated. His code started at 5:38 p.m. and lasted a full hour. At the conclusion of his code he was brain dead. Unfortunately, the doctor mistakenly intubated the man's esophagus rather than his trachea, making it impossible for him to breathe. The doctor also failed to use capnography while he was in the PACU. Since capnography is a method of monitoring the concentration of carbon dioxide in the lungs, it could've verified that the man's airway was not properly positioned to supply oxygen to his body and brain. Even without the capnography, the man's doctors eventually realized that he wasn't breathing. They ordered a portable chest x-ray in order to visualize how the endotracheal tube was positioned, but a doctor misread the x-ray, incorrectly reporting that the man's airway was properly intubated. Once a code was called, the code leader also failed to ensure that the man's endotracheal tube was placed appropriately. Throughout the entire code, the endotracheal tube remained in the same position, negligently supplying oxygen to the man's stomach rather than his lungs. Eventually, the man's restricted oxygen supply caused him to suffer a hypoxic brain injury. He died as a result of his brain injury less than two months later. 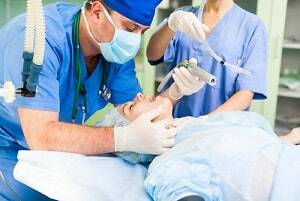 Patients can survive an improper intubation if their doctors recognize and correct the problem quickly enough, while there is still enough oxygen in the bloodstream to keep the brain healthy. If a patient is incorrectly intubated long enough for the blood oxygen supply to deplete, then tissue throughout the body will not be supplied with enough oxygen to remain healthy. Since brain tissue requires a particularly large amount of oxygen to function, an oxygen-deprived patient might suffer a hypoxic brain injury, resulting in brain damage or death. The term "hypoxia" literally means "without oxygen." Plaintiff's economist calculates a $1.3 million economic loss for the victim's family. There is a lot more to say about this case and there has been a lot of very interesting developments. This case was found for a while in Health Claims Arbitration before going to Montgomery County Circuit Court. But this is a Miller & Zois case so we are probably better off no divulging much more. Failing to place the endotracheal tube in the correct position at the conclusion of surgery. Failing to verify that the airway was in the proper position before or after transport to the PACU. Failing to use or order capnography. Failing to perform and correctly interpret a STAT portable chest x-ray. Failing to replace the incorrectly placed endotracheal tube during the code. Failing to provide an adequate supply of oxygen. Read more about airway management and intubation error lawsuits. Take a look at other malpractice claims filed against Suburban Hospital.